Sen. Bernie Sanders (I., Vt.) continued his call for single-payer health care on Wednesday, sharing a video that features entertainers, filmmakers, and billionaires voicing support for the plan. Sanders, a vocal proponent of the United States moving to a single-payer system, tweeted out the video and commented on how the public figures understand how economically advantageous such a system would be. The video starts out with decades-old footage of Sanders talking about universal health care before it transitions to feature clips of celebrities and ultra-wealthy supporters. Documentary filmmakers Al Gore and Michael Moore, several entertainers, and even a few billionaires appear in the video assembled from a variety of interviews. "With my limited knowledge, I think [single-payer] is probably the best system," billionaire Warren Buffett says in the video. "We are such a rich country—in a sense we can afford to do it." Buffett adds that it would bring down costs, which he points out is simply an effective business practice. Buffett's fellow Berkshire Hathaway executive, billionaire Charlie Munger, says in the video that the current U.S. health care system puts American companies at a disadvantage. "It gives our companies a big disadvantage in competing with other manufacturers," Munger says. "They've got single-payer medicine and we are paying out of the company." Sanders' video does not just cite billionaires who think single-payer would help business, but also celebrities who support the system. "We need to push for single-payer insurance, Medicare for all," Moore says. "The kind the Canadians have, the kind that every other civilized democracy on the planet has." Contrary to Moore's comments, many Western democracies do not have single-payer health insurance. Germany and Switzerland, for example, both have systems that are similar to Obamacare, rather than single-payer. Sanders' video goes on to include clips from Arcade Fire singer and guitarist Win Butler, a tweet from singer John Legend, and a variety of clips from former "Daily Show" host Jon Stewart. "A single-payer system is the only way that will effectively manage health care and keep costs down," Stewart says. A report by the nonpartisan Urban Institute concluded that Sanders' plan would increase health care expenditures by $6.6 trillion over ten years. 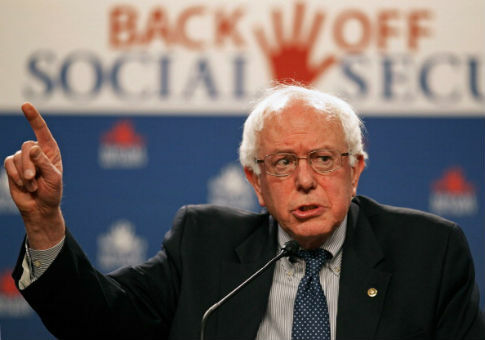 Economist Howard Gleckman has argued that Sanders' economic plan would lead to an "unprecedented increase in government borrowing." Moore admitted that the problems with Obamacare cost Democrats votes in the 2016 election, and said addressing those problems with a single-payer system should be the next move. "We have to push for this because we do need to fix these parts of Obamacare that did cost us votes in November," Moore said. Fellow filmmaker and former Democratic Vice President Al Gore agreed that single-payer is the right way forward for his party. "Starting in 2002, I came to the conclusion that we should go to single-payer," Gore said. "Medicare for all would be an easy way to do it." This entry was posted in Issues and tagged Bernie Sanders, Health Care, Michael Moore, Obamacare, Warren Buffett. Bookmark the permalink.